March 27, 2011  Moammar Gadhafi's regime is using all its weapons — guns, tanks and propaganda — to prevent a nationwide movement for change. But there are signs Gadhafi's grip on the capital could be loosening. NPR's David Greene has spent the past month covering the conflict. As he prepares to leave Libya, he has a few reflections. March 24, 2011  The Libyan government brought more than a dozen coffins to a cemetery along the Mediterranean Thursday, insisting the people died in coalition air strikes. U.S. and British officials have said their strikes haven't killed civilians. And some residents in Tripoli say quietly it's all a propaganda hoax by the Gadhafi regime. March 23, 2011  A defiant Moammar Gadhafi appeared on state television in Libya Tuesday night, rallying supporters from inside his military compound. Meanwhile, more explosions and anti-aircraft fire were heard in Tripoli just before sunrise. The coalition strikes have been damaging buildings as well as the Libyan leader's grip on power. March 22, 2011  Since Saturday, coalition forces have been launching airstrikes against Libyan air defenses, tanks, armored personnel carriers and other military hardware. The United Nations has refused an emergency request by Libya for a meeting to talk about the conflict. In the capital Tripoli, a government spokesman says the world is not allowing Libya to defend itself. March 21, 2011  Air strikes continued against installations and forces of the Libyan government. Secretary of Defense Robert Gates said Monday that the U.S. will turn over "primary responsibility" for the operations to allies in a matter of days. NPR's David Greene talks to Melissa Block with the latest. March 21, 2011  With U.S. and allied forces using missiles and bombs to strike at the heart of Moammar Gadhafi's military defenses, the Libyan leader finds himself standing alone against the world once more. 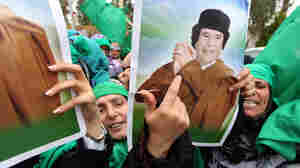 But in Libya's capital, where part of Gadhafi's compound was hit Sunday, his supporters celebrated his continued defiance. March 18, 2011  Libya today declared a full ceasefire, vowing to halt military operations against rebel fighters. It may not be enough, though, to thwart air strikes from countries, including Britain and France. They're poised to act on a United Nations Security Council resolution authorizing military action to halt Moammar Gadhafi's campaign to crush his opposition. U.S. and European leaders said Libya must do more than offer promises. And there are indications Gadhafi's forces haven't eased up at all. March 17, 2011  On state television, Gadhafi's regime has dangled an offer of amnesty for those who put down their arms. But there is still fear that those who fought the government — even those who just joined in protests — may never be safe. March 15, 2011  Libya's government has been insisting it's not at war with its own people. 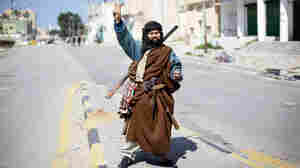 Officials claim Islamist radicals from outside Libya are behind the uprising. And Tuesday, they set out to prove it — showing journalists a prisoner whose story neatly fits the profile the government has been highlighting. March 10, 2011  In Libya, residents in cities held by the opposition are gripped with fear. Their cities may be in the hands of the rebels, but government troops are poised to attack. NPR's David Greene reports on three Libyans who managed to cross the border and tell their stories. March 9, 2011  The Tunisia town of Ben Gardane borders with Libya. The town is home to a vibrant and colorful Libyan-Tunisian economy. But the uprising in Libya is changing the way of life for business owners in Ben Gardane. March 7, 2011  In western Libya, government soldiers are surrounding individual towns and cities, with rebels holed up inside. It has been little covered by the Western media because the area is all but sealed off to everyone but residents and soldiers.